Less than a second to the average person is nothing. For a track and field sprinter, it’s a lifetime. And that’s how close Diondre Batson, All-American sprinter for the American River College track and field team, is from the world record in the 100-meter dash. Batson began this season the same place he left off during last season’s state title championship: running like the wind. He ran in and won the 100 and 200 at the Big 8 conference championships and was able to run a 10.39 100, his best time so far. 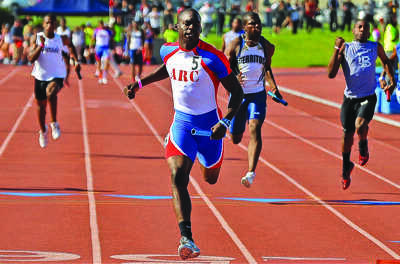 Batson was also a leading part of the 4 x 100 meter relay team that won both state and the Big 8 conference championships. This year at the Beaver Relays on March 3 he ran a 10.43 (seconds in the) 100 and 21.16 in the 200, two of his best events. Those times are already half a second better than the second place finisher in both races. Batson’s only problem so far may be easing up at the end of the race. “Sometimes I get in trouble for it because my coach tells me to run through the tape,” Batson said. Batson has been on the move on and off the track his entire life. Born in Oklahoma, but raised in the Los Angeles suburbs of Woodland Hills and Inglewood, Batson began running competitively at 7. His family moved to Sacramento during his freshman year in high school because his mother “found a better job” here in the capitol city. After moving from Taft High School in Los Angeles, Batson enrolled at Laguna Creek High School in Elk Grove where he played football and ran on the track team. His offensive stats in football as a wide receiver were excellent. He was tops on the team in receptions, receiving yards, and touchdowns with 6 including a 80 yard touchdown and also a field shrinking 19.58 yards per catch. But where his blazing speed stood out most was on the track. That speed in the 100, 200, and 4 x 100 races, events he stars in now, let him become heavily recruited out of high school. “Because of all the training and stuff I used to do I knew this was something I could be really good at” Batson said. But he didn’t have the proper algebra class completed in high school, so Batson had to put his hopes of going to a four-year program on hold. However, interest from schools has returned. With his times last year and strong start this year, top-flight track and field programs such as Texas, Texas A&M, and Arkansas are showing interest and talking with Batson. But Batson isn’t just going to coast on his early success and get too comfortable with the schools. He is looking to improve wherever he can. Besides hard work Batson offers another reason and insight to why he is so fast. Along with providing him with his skills she is also the main motivation driving Batson. It’s where he finds that extra gear. Batson hopes that motivation and hard work can take him all the way to the Rio de Janeiro Olympics in 2016. He has been participating in USA outdoor meets as his way to get his name out there and let people know about him. But it’s all things that are under his control for Batson. Superstition and rituals are not his thing. With times like those there’s a reason to think nobody will. Be the first to comment on "Beaver sprinter leading the pack"